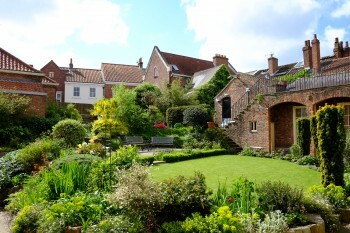 Come and join us in this hidden gem – the society’s secret garden in the heart of Stonegate. A great opportunity to meet new colleagues and existing York Medical Society members from both primary and secondary care. We’re going to kick off with a glass of something chilled on arrival, giving you the opportunity to enjoy the company of other members in the gardens. This will be followed by a tutored tasting of assorted new wines, accompanied by slides and the stories behind the wines and the growers from our very productive Spring trip to France. There are some great new Whites, ranging from exotic Mediterranean blends to terroir-rich White Burgundy. Showing that Rosés have moved up several leagues, there is a fabulous barrel-fermented Rosé from Saint Chinian. Representing the Reds, we’ve got some award-winning wines, using Merlot, Syrah &Cabernet Sauvignon from the small appellation of Cabardès, that will enchant you, not to mention some other exotic Southern reds to relish, even some gorgeous Pinot Noir! Tickets are £10 a head, for both members and their guests.